For those who may be curious, think of the Citizen Score, sometimes referred to as a trust score, as akin to a credit score but one that encompasses every conceivable aspect of one's life. Buy video games and your score drops because the government assumes you are idle, buy diapers and it rises because you seem more stable. Get a traffic ticket or speak out about the government, and your score drops, but earn a degree or support the Party and your score might rise. Miss paying your bills or don't support your parents and your score will suffer. Read books that the party doesn't deem ideologically sound or watch foreign movies, and your score will take a hit. China has spent years integrating its digital surveillance infrastructure so that it can connect every aspect of its citizen's lives. Compliance with the Communist Party, by individuals and businesses alike, can now be rated quantitatively on a scale through secret algorithms that constantly monitor thousands of behaviors. And the Citizen Score matters. For a Chinese citizen, it determines what schools and universities will accept him, what jobs he can apply for, the interest rate and availability of loans and it is even being used to determine if someone is fit for dating. The system was first outlined in a 2014 document entitled "Planning Outline for the Construction of a Social Credit System" and it came in response to an appalling number of scams, governmental corruption and sporadic violent reactions by citizens to abuses of power. 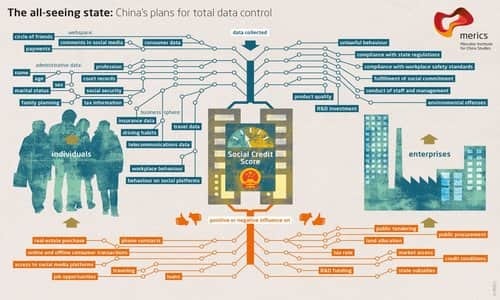 The Social Credit system promises to solve both problems as it attempts to blacklist with low trust score those Chinese responsible for swindling their comrades and allows the central government to keep tight control on any dissent in the citizenry. At the root of the problem is the philosophy behind the Cultural Revolution and the Great Leap Forward so many decades ago. In its attempt to reshape Chinese society into a Communist utopia that would sweep away all the old oppressive structures, to be replaced only by the Party, the traditional sources of values and trust were weakened or destroyed. Religion, family and community organizations were all torn down and replaced with the machinery of the State. But the State was not loving and did not build relationships. Corruption and abuse in government officials only amplified a problem that had festered deep in a culture that had stripped away its own moral values. The Citizen Score is social control taken to levels that even Orwell never imagined. Disagree with the party, push for greater freedom of speech, freedom to worship or a more open Internet, and your score will suffer. The interest rates you get offered on loans will rise and the jobs you want will suddenly become unavailable. If the score drops low enough, you can be blocked from buying plane, train or bus tickets. Drop even lower and your bank accounts may be frozen, your social media accounts cut off and your email restricted. Police records, bank data, traffic violations, educational histories, personal communication, purchases you make online and videos you watch are only just part. Your score can be affected by those linked to you in your social circle. Associate in person or online with someone who has a low Citizen Score and your score will suffer as well. Toe the party line, inform on your neighbors and you may see your score rise a few points. The system represents the ultimate goal of any totalitarian regime and for the Chinese Communist Party, obsessed with control, realizing the Social Credit system would bring it measurably closer to its version of utopia. But the plan is not without its challenges. Implementing such a system for 1.3 billion people is an immense technological challenge and the algorithms that adjust the scores run the risk of being subjective in a way that unbalances the system or bring negative public opinion. A pilot program in Jiangu Province in Southern China in 2010 provided some lessons on what could go wrong. In Suining County, the government awarded points for good behavior and subtracted points for violations. The maximum score in this pilot program was 1,000 but minor traffic tickets would set someone back 20 points and running a red light or paying a bribe would be another 50. Certain religions associations would cost their members 50 points and complaints of poor elderly care would be another 50. Improper use of the Internet was a 100-point violation and protesting a government office 50. As the infractions mounted, the system, as a tool of social control in favor of a despotic government, become increasingly clear. Those Chinese citizens who dropped low enough were barred from receiving government support or holding any jobs while the obedient received favorable loans, employment and special treatment when starting businesses. Strong public outcry compelled the government to discontinue the test and apply what it had learned to the current system, but such a protest won't be possible when the social credit system is implemented nationally. When the Citizen Score becomes compulsory in 2020, there may be no escaping its hold or reach and no end in sight. If applied subtly enough, it can bend and shape every Chinese into an obedient servant of the State. The penalties for "breaking trust" may be small at first as they act as incentives to obey, but at their full application they can turn all of China into a prison for entire classes of people. For the Chinese Community Party, this may be the harmonious utopia it has always lusted after, but for the human beings living under its thumb, the Citizen Loyalty Score could be the worst dystopia for individual freedom imaginable.